A Defense Advanced Research Projects Agency (DARPA) funded prosthetic arm will be released for commercial use beginning late 2016. 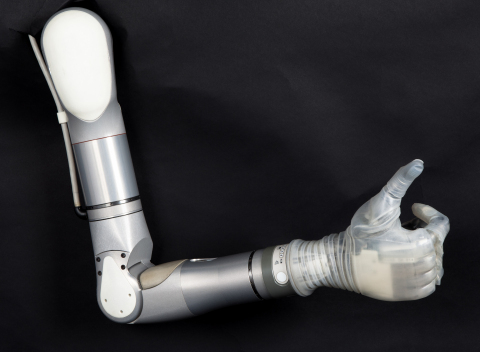 The LUKE arm, one of the world’s most advanced prosthetics, was designed by Segway creator Dean Kamen, and has been under development for close to a decade. The LUKE arm is named after Luke Skywalker’s advanced prosthetic from the Star Wars films, and its banner feature is its control system. It uses electrodes placed on the residual limb to pick up electrical signals from the user’s muscles. When the user tenses or flexes their arm, the LUKE changes its position and grip. This is much more intuitive than more basic prosthetics, which are generally controlled with switches or buttons, or adjusted manually by the wearer. A separate control system is also available for the LUKE that uses wireless sensors placed in the wearer’s shoe. Unlike regular prosthetics, the LUKE also has more degrees of flexibility and movement. The shoulder, elbow, and wrist are all individually powered so the wearer can reach over their head and behind their back. The four independent motors in the hand allow the wearer to securely grip anything from a glass of water to a single egg. Force sensors in the fingers also give the wearer feedback on how hard they’re gripping. Continuing the theme of prosthetics designed with favorite characters in mind, Robert Downey Jr. delivered an Iron Man-themed 3D printed prosthetic arm to a child back in March of 2015. This avenue, albeit with less features, offers solutions for a fraction of the price.